The Arturo Fuente Factory Tour Sampler includes some of the tastiest cigars the Fuente brand carries. Each cigar is a masterpiece, blended and hand rolled by the world's finest cigar crafters. If you're looking for a variety of cigars with a great taste, this is it! 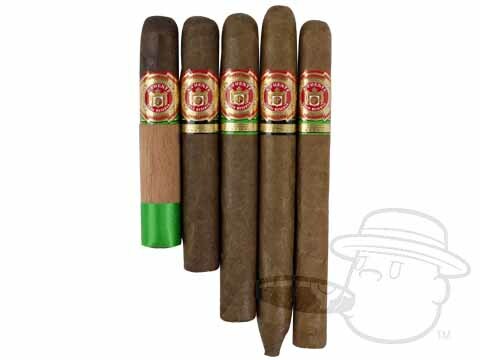 This sampler showcases Fuente's finest and includes one of each: Don Carlos Robusto, Chateau Maduro, 858 Maduro, Hemingway Classic, Spanish Lonsdale Natural. Very nice selection and enjoyable smokes. Its Artura Fuente -Do they make a poor cigar! Love Arturo Fuente cigars! Great flavor that only Arturo Fuente cigars can provide! Can never go wrong with Fuente! And what's not to like about getting a variety. The 858 is one of my favorite cigars, period! Thanks BCP for putting a tasty sampler together!! All of these cigars were of the quality that I have grown to expect from Arturo Fuente. They are medium to full bodied smokes that are consistently well rolled. Just the right draw and great flavor. My “go to” favorite is the 8-5-8 naturals. Always a great smoke and I highly recommend these cigars. Arturo Fuente Factory Tour Sampler is rated 4.6 out of 5 based on 8 customer ratings.